This week’s news got totally weird in one day. We went from net neutrality to llamas on loose to the color of a dress in a poorly taken photo. HOW? Anyways, I decided to avoid those topics because I read a lot of interesting things this week that had nothing to do with either of those three very popular topics from yesterday. I’m also back to reading a lot of human interest pieces. I’m not saying that humanizing others is more important than what color a dress is… but… it is. How a book club is helping to keep ex-offenders from going back to jail– I know that expressive writing is helpful even for all sorts of people. Studies have actually proven that it can help mental health. So this article isn’t much of a surprise, but it is encouraging. It also suggests a model for programs that need to be more regular. Aside from that, this article helps us remember why rehabilitation not just punishment is wildly under considered in our punitive system. The girl who gets gifts from birds– A girl getting gifts from her crow friends is not as important as net neutrality, I know, but it is really sweet. Sometimes we just need reminded of sweet little girls who care deeply in the world. And I found the imagery particularly beautiful for such a strange little story. Banksy just published a new video from Gaza– Banksy is at it again with some powerful imagery in Gaza. I like the satire. I like the contrast. 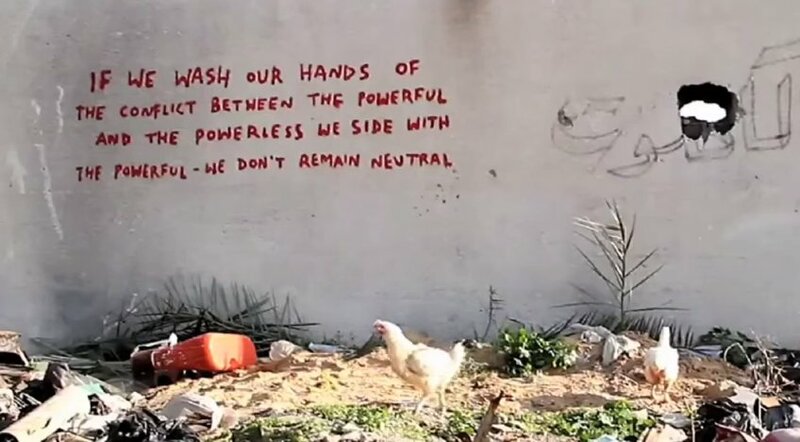 I particularly like the quote “If we wash our hands of the conflict between the powerful and the powerless we side with the powerful- we don’t remain neutral.” Important stuff to consider. Robin William’ daughter Zelda on life without her dad, continuing his charity work– Zelda Williams is bravely talking about her dad, furthering his legacy and dealing with a suicide death. Her words remind us once again of the wonderful man Robin Williams was and the importance of talking about mental illness. A Mission of Mercy– This story is close to my heart because more than addressing the legal or political issues of crossing the border to give birth, it addresses a heartbreaking story about motherhood. It also talks about how the writer subverted his self-righteous, Americanized views of immigrants and started seeing this mother as a human going through something very painful. Don’t read the comments section though; it devolved into nastiness as usual. ‘She’s OCD!’ ‘He’s Schizo!’ How Misused Health Lingo Can Harm– This article explains the way that our popularized use of mental health terms is adding to the stigma. We don’t often think about it, but this is pretty important. Language is powerful and we should use it responsibly. Don’t call organized people OCD. Louisville Man’s Life and Death Highlights Plight of Homeless– This sad story, for me, explores the various complexities involved in homelessness. I like the way this article makes the subject empathetic without ignoring the demons he faced. There are a lot of stigmas about homeless people that allow us to fail to explore the many, many reasons people are stuck where they are. We can’t even being to solve the problem until we understand the humans facing it. Why serious journalism can coexist with audience pleasing content– It’s about time we stop being so darn pretentious and remember that journalism and entertainment have always coexisted. The Internet poses some challenges in terms of keeping serious and entertaining journalism separate, but that doesn’t mean it can’t be done. And if I see one more complaint about clickbait, I’ll have a fit. Headlines have been made purposefully enticing for years. Don’t click on what you don’t want to click on, but also please limit your archaic complaints and self-important tirades against listicles. End rant. Ok so that last one didn’t quite fit in with my whole “being decent on the Internet” post from earlier in the week. You can complain about anything you want, but often times the people complaining about such things are as hyperbolic as the headlines they are complaining about.